Renault seems like to be intended to create a bridge connecting the F1 technology world with that of production cars. 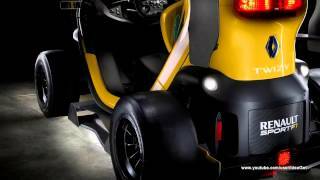 Team Renault presented the Twizy Sport F1 Concept 2013 electric urban compact car, which is an unmatched combination of muscular style and performance. The single seater race car Twizy Renault Sport F1 is commendably equipped with features creating its body which showcases the concept’s ties with motor racing’s premier category.The engineers at Renault Sport F1 and Renaultsport together portrayed the gem of teamwork to create this model, which will enable its rider to touch 100 km h with as ease as Megane Renaultsport 265. Let us check out more of its features and Performance statistics. 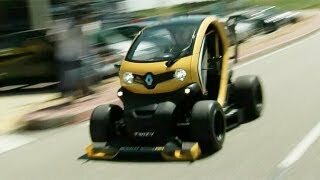 Renault Twizy RS F1 Concept 2013 is a performance oriented electric urban car concept, this on its own conveys that the convenience features can never by anything apart from the features that make you control and relish the power so generated by it. The main among all, standing first in lieu is its own data logging system. All information required by the driver gets displayed on a multi page screen mounted on steering wheel. The display offers you the rights to personalize information, as to what you want to see and what not, taking both under hood, related to Twizy or to the KERS F1 electronic systems. It offers you arena to display like the main battery charge, KERS battery charge, oil pressure, water temperature etc. 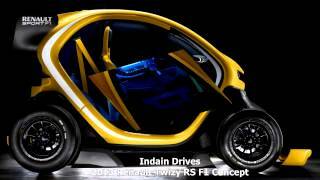 The Renault Twizy Sport F1 Concept also has ‘RS Monitor’ similar to one mounted in furious models like Megane R.S. and Clio R.S. allowing the driver to monitor performance stats in real time. · An electric motor generator unit which is linked to driver shaft. This element serves the purpose of both generator and motor. · Lithium-ion batteries store the power. · KERS control unit that further switches to ‘motor’ mode and uses this stored energy to deliver six times more power to wheels through motor.